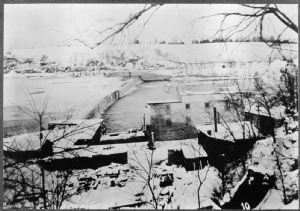 A view of Dam 5 from the West Virginia side showing the Honeywood Mill settlement. This was originally built as a flour mill in the 1830s, and converted to a pulp grinding mill in the 1880s. The hydroelectric generating equipment was installed by Martinsburg Power Company in 1904. Across the river the lockhouse for the keeper of the lock at Dam 5 is visible. The photograph was available from the Potomac Edison Library in Hagerstown. It is part of the Historic American Buildings Survey/Historic American Engineering Record at the Library of Congress.